2008-02-07 First worldwide family litigation filed litigation Critical https://patents.darts-ip.com/?family=9927912&utm_source=google_patent&utm_medium=platform_link&utm_campaign=public_patent_search&patent=KR100657667(B1) "Global patent litigation dataset” by Darts-ip is licensed under a Creative Commons Attribution 4.0 International License. A method and system of transferring messages from a message source to a mobile station in a cellular system comprises assigning to each message a priority characteristic before the message is transmitted to mobile station. The message is then transmitted together with the assigned priority characteristic, depending on the priority characteristic. The priority characteristic is examined at the mobile station and the message is processed at the mobile station depending on the priority characteristic. 본 발명은 전반적으로 이동 통신 환경에서 메시지들을 처리하기 위한 방법 및 장치에 관한 것이다. The present invention relates to a method and apparatus for processing messages in a mobile communication environment generally. 이동 원격통신 서비스의 일 특징은 소위 단문 메시지 서비스(SMS), 즉, 텍스트에 기초한 메시지들이 지국들(통상 두 개의 이동국들) 사이에서 전송될 수 있는 서비스이다. One feature of the mobile telecommunications service is a service that can be transmitted between the so-called Short Message Service (SMS), that is, the message based on a text to stations (typically two mobile stations). 이러한 서비스는 특히 CDMA 및 GSM 네트워크들과 같은 디지털 네트워크들에서 이용된다. These services are used in particular in digital networks, such as CDMA and GSM networks. SMS는 수익 모델로서 상기 SMS를 보는 서비스 제공자들과 또한 고객들에게 인기가 있는 것으로 증명되었다. SMS has proven popular with customers and service providers also see the SMS as a business model. SMS 메시지는 매우 인기가 높으며 유행하는 것으로 증명되었으며, 차세대(소위 3G) 셀룰러 서비스들이 이용가능하게 될 때 수익을 증가시키는 한 방법으로서 서비스 회사에 의해 인식되었다. SMS messages are very high in popularity proved that fashion, was recognized by as a way to increase revenue as the next generation (so-called 3G) cellular services will be made available to the service company. 그러나, 위의 설명되어진 SMS 장치에는 문제점이 있다. However, there is a problem in SMS device been described above. 일반적으로, 핸드셋은 한 타입의 메시지(단문 메시지 서비스 규격에 의해 정의됨)를 단지 인지하며, 따라서 그러한 모든 메시지는 동일한 우선순위를 갖는다. In general, handset, and if only a (defined by the Short Message Service specification), a message of one type, hence all the messages that have the same priority. 따라서, 이는 특정 메시지가 다른 메시지보다 더욱 중요한지 여부나 그것이 반드시 디스플레이되어야 하는지 혹은 나중에 보기 위해 저장되어야 하는지 여부를 구별하는 방법이 없다는 것을 의미한다. Thus, this means that there is no way to tell whether a particular message will be saved for later viewing, or that to be sure whether it is more important to me than any other display messages. 이동국은 단지 SMS 메시지 등을 저장하기에 이용가능한 제한된 메모리 양을 갖는다. The mobile station only has a limited amount of memory available for storing messages, such as SMS. 일단 메모리가 가득 차면, 메모리에서 공간이 클리어될 때까지 이동국은 추가적인 SMS 메시지들을 수신할 수 없다. Once the memory is full, the mobile station can not receive further SMS messages until a clear space in memory. 따라서, 이동국이 가용한 메모리 용량을 갖고 있는지 여부에 상관없이 상기 이동국이 도달할 수 없는 것으로서 확인되지 않는다면, 우선순위 메시지의 상술된 전송이 시도될 것이다. Therefore, the mobile station does not identified as the mobile station can not be reached, regardless of whether or not to have a memory capacity available, it will be the above-described transmission of the priority message attempts. 3G 서비스가 실현되기 시작함에 따라, 네트워크(통상적으로 셀룰러 전화 서비스 제공자)는 핸드셋 위치에 기초하여 상기 핸드셋으로 메시지들을 목표지정함으로써 수익을 올리고자 하는 방식을 고찰한다. As the 3G services begin to be realized, the network (typically cellular telephone service providers) will be examined how the chair raising revenue by targeting messages specified by the handset based on handset location. 네트워크가 3G(또는 그 이후의 세대) 규격들로 업그레이드됨으로써, 네트워크는 상기 네트워크에서 3각 측량을 사용하거나 핸드셋에서 GPS 수신기를 사용하여 각각의 핸드셋의 위치에 대한 정보를 보유할 것이다. By the network is upgraded to the 3G (or later generations) specifications, networks will hold information about the position of each handset, using triangulation in the network or using the GPS receiver in the handset. 이는 네트워크로 하여금 각각의 개별적인 핸드셋에 대한 위치 감응 서비스를 타겟화 할 수 있게 할 것이다. This will allows a network to a targeted location sensitive services to each individual handset. 당연히, 이는 광고자들로부터 큰 다량의 이점을 발생시킨다. Of course, it generates much of the benefit from the large advertisers. 일예로, 사용자는 주변에 인접한 백화점에서의 세일이나 인접한 식당에서의 점심 특별 메뉴를 자신에게 알려주는 메시지 정보를 수신할 수도 있다. As an example, the user may receive the message that the information indicating the lunch special menu in three days or in the adjacent dining room is adjacent to a department store around him. 이러한 가능성은 무한하다. The possibilities are endless. 이러한 모든 것들의 한가지 단점은 이동 핸드셋들이 자신이 수신한 메시지들을 저장하는 한정된 크기의 메모리를 갖는다는 것이다. One disadvantage of all these things is that mobile handsets will have a limited amount of memory to store the messages it receives. 따라서, 이러한 메시지들을 분류하거나 우선순위를 정하기 위한 시스템이 필요하다. Therefore, it is necessary first to classify these messages or the system for determining the rankings. 이를 위해서, 상기 메시지들이 도착할 때, 메시지들이 어떻게 처리되어야 하는지를 표시하는 우선순위 그룹으로 상기 메시지들을 분류시키는 것이 필요하다. For this purpose, it is necessary to classify the message as a priority group when they arrive at the message, indicating whether how messages should be processed. 제 1 카테고리화 인자는 전송자의 식별일 수 있다. The first categorization factor may be an identification of the sender. 만약 전송자가 (예컨대, 핸드셋 전화 북을 통해) 사용자에게 알려진 사람이라면, 디폴트 액션은 차후 검색을 위해 메시지를 저장하고 메시지 도착을 사용자에게 통보하는 것이다. If the sender is someone known to the user (for example, through the handset phone book), the default action is to save the message for later retrieval and notification messages reach the user. 그런 후에, 사용자는 한가한 때에 메시지를 검색할 수 있다. Then, the user can retrieve messages when idle. 만약 메시지가 첨부되어 있는 선택적인 존속 상황(optional survival condition)을 갖는다면, 그 메시지는 상기 존속 상황이 더 이상 올바르지 않을 때까지 세이브되어야 하고, 상기 존속 상황이 더 이상 올바르지 않으면, 상기 메시지는 자동으로 삭제되어야 한다. If the message is if you have a selective survival situation (optional survival condition) is attached, the message is to be saved until the survival condition is no longer valid, the existence condition is no longer valid, the message automatically It shall be deleted. 만약 전송자가 사용자에게 알려진 사람이 아니면, 핸드셋은 유사하게 메시지의 우선순위를 정할 수 있다. If the sender is not a person known to the user, the handset can similarly prioritize the messages. 본 발명은 이동국에 의해 수신될 수 있는 잠재적으로 매우 많은 수의 SMS 메시지들을 처리하고 그것들의 우선순위를 정하기 위한 방법 및 장치를 제공함으로써 이동 핸드셋이 수신할 수 있는 잠재적으로 상당한 양의 메시지를 처리하는데 있어서의 문제점을 해결하고자 하는 것이다. The present invention for processing a large amount of message, potentially capable of receiving the mobile handset by a potential that can be received by the mobile station process the very large number of SMS messages and provide a method and apparatus for determining the their priority It is intended to solve the problems of. 본 발명의 일양상에 따르면, 우선순위 특성(priority characteristic)을 메시지에 할당하는 단계(24); According to one aspect of the invention, the first step of assigning a rank attribute (priority characteristic) in message (24); 이동국(11,12,13)에 상기 할당된 우선순위 특성과 함께 상기 메시지를 전송하는(32) 단계; (32) transmitting the message together with the assigned priority characteristic to the mobile station (11,12,13); 상기 이동국(11,12,13)에서 상기 우선순위 특성을 검사하는(24) 단계; 24, the method comprising examining the priority characteristic at the mobile station (11,12,13); 및 상기 우선순위 특성에 의존하여 상기 이동국(11,12,13)에서 상기 메시지를 처리하는(24) 단계를 포함하는 메시지 소스로부터 셀룰러 시스템(10) 내의 이동국(11,12,13)으로 메시지를 전달하는 방법으로서, 상기 메시지 전송(32)은 상기 우선순위 특성에 기반하며,상기 이동국(11,12,13)에서 상기 메시지를 처리하는(24) 상기 단계는 상기 우선순위 특성에 기반하여 메시지에 대한 우선순위를 이동국에서 독자적으로 할당하고, 상기 우선순위에 기반하여 상기 메시지를 저장하는(28) 것을 포함하는 것을 특징으로 하는 방법을 제공한다. And the message to the mobile station (11,12,13) ​​in the priority depending on the priority characteristic the mobile station (11, 12, 13), the cellular system 10 from the message source including the 24 step of processing the message from the a method for transmitting, 24 is the step for processing the message in the message transmission (32) is based on the priority characteristic and the mobile station (11, 12, 13) is a message based on the priority characteristic assigning a priority to the mobile station on its own, and there is provided a method characterized in that it comprises the 28 to store the message on the basis of the priority. 본 발명의 다른 양상에 따르면, 메시지에게 우선순위 특성을 할당하는 수단(24); According to another aspect of the invention, means for assigning a priority characteristic of a message (24); 상기 메시지를 상기 할당된 우선순위 특성과 함께 이동국(11,12,13)으로 전송하는 수단(32); Means (32) for transmitting to the mobile station (11,12,13) ​​together with the assigned priority characteristic of the message; 상기 이동국(11,12,13)에서 상기 우선순위 특성을 검사하는 수단(24); Means for examining the priority characteristic at the mobile station (11, 12, 13, 24); 및 상기 이동국(11,12,13)에서 상기 우선순위 특성에 기반하여 상기 메시지를 처리하는 수단(24)을 포함하는 메시지 소스로부터 셀룰러 시스템(10) 내의 이동국으로 메시지들을 전달하는 시스템으로서, 상기 메시지 전송은 상기 우선순위 특성에 기반하며, 상기 처리 수단(24)은 상기 우선순위 특성에 기반하여 상기 메시지에 우선순위를 독자적으로 할당하며, 상기 이동국(11,12,13)은 상기 우선순위에 따라 상기 메시지를 저장하는 수단(28)을 추가로 포함하는 것을 특징으로 하는 시스템이 제공된다. And a system for the mobile station (11, 12, 13) delivering the message to the mobile station in the cellular system 10 from the message source, including means (24) for processing the message based on the priority characteristic at the message the first transmission is based on a priority characteristic, and said processing means 24 assigns a priority to the message based on the priority characteristic on its own, the mobile station (11,12,13) ​​depending on said priority the system according to claim further comprising a means (28) for storing the message is available. 본 발명은 또한 메시지 소스로부터 메시지를 포함하는 신호를 수신하는 수신기(22) - 상기 메시지는 할당된 우선순위 특성을 가짐 -; The invention further receiver 22 for receiving a signal containing a message from a message source, said messages having an assigned priority characteristic; 및 메시지 데이터를 저장하는 저장부를 포함하는 메시지를 수신하는 이동국(11,12,13)으로서, 상기 메시지의 우선순위 특성을 검사하며 상기 우선순위 특성에 기반하여 상기 메시지에 우선순위를 독자적으로 할당하고, 상기 우선순위에 기반하여 상기 저장부(28)에 상기 메시지 데이터를 저장하는 제어기(28)를 더 포함하는 것을 특징으로 하는 이동국을 제공한다. And a mobile station (11, 12, 13) for storing received messages including a message to store the data, examine the priority characteristic of the message, and assigning a first priority to said message on its own on the basis of the priority characteristic , provides the mobile station based on the priority in the storage unit (28) characterized by further comprising a controller (28) for storing the message data. 첨부된 청구항에서 상세히 설명되는 본 발명의 위의 특징 및 다른 특징과 그것들의 장점은 첨부 도면을 참조하여 주어지는 본 발명의 예시적인 실시예에 대한 다음의 상세한 설명을 고려함으로써 더욱 명확해질 것이다. And other features and their advantages of the above invention is described in detail in the appended claims will become more apparent from a consideration of the following detailed description of the exemplary embodiments of the invention given with reference to the accompanying drawings. 도 1은 단문 메시지 서비스(SMS) 설비를 포함하는 셀룰러 통신 시스템의 개략적인 시스템 다이어그램. 1 is a schematic system diagram of a cellular communications system including a short message service (SMS) facility. 도 2는 도 1의 셀룰러 통신 시스템의 이동국에서 수신기의 개략적인 시스템 다이어그램. Figure 2 is a schematic system diagram of a receiver in a mobile station of a cellular communication system 1. 도 3은 도 1의 셀룰러 통신 시스템의 이동국에서 송신기의 개략적인 시스템 다이어그램. Figure 3 is a schematic system diagram of a transmitter in a mobile station of a cellular communication system 1. 첨부 도면의 도 1은 단문 메시지 서비스(SMS) 설비를 포함하는 셀룰러 통신 시스템(10)을 도시하고 있다. Of the accompanying drawings Figure 1 illustrates a cellular communication system 10 that includes a short message service (SMS) facility. 단문 메시지 서비스(SMS)는 이동 핸드셋, 즉 이동국(MS;11,12,13)으로/으로부터 제한된 크기의 메시지들을 전송하는 수단을 제공한다. Short Message Service (SMS) is a mobile handset, or mobile station provides a means for sending messages of limited size to and from the / (MS 11,12,13). 단문 메시지 서비스의 제공은 서비스 센터(14)를 이용하고, 상기 서비스 센터(14)는 메시지들을 위한 저장 및 전송 센터로서 기능을 한다. Providing a short message service by using the service center 14 and the service center 14 functions as a store and forward center for messages. 상이한 두 개의 포인트-투-포인트 서비스들이 정의되었다. Two different point-to-point services are defined. 이들 중 제 1 포인트-투-포인트 서비스는 이동 발신(MO) 메시지들인데, 이것은 이동국(11, 12, 13)으로부터 이동 시스템 제어기(MSC;15)와 연관된 SMS 서비스 센터(14)에 전송될 것이다. Of these, the first point-to-point service is the mobile originating (MO) message, which mobile system controller, from the mobile station 11, 12 and 13; to be sent to the SMS service center 14 associated with a (MSC 15) . MO 메시지는 기지국 제어기(BSC;19)를 통해서 기지국(17, 18)을 경유하여, 이동 시스템 제어기(15)에 접속된 공중 교환 전화망(PSTN;20)과 같은 고정 네트워크 상의 가입자나 다른 이동국(11,12,13) 중 어느 하나로 전송된다. MO message is a base station controller; (; 20 PSTN) and a fixed subscriber or other mobile stations (11 in the network, such as (BSC 19) for via a base station (17, 18), the mobile system controller 15, a public switched telephone network connected to the via , 12, 13) is any one of the transmission. 제 2 포인트-투-포인트 서비스는 이동 착신(MT) 메시지들인데, 이것은 서비스 센터(14)로부터 이동국들(11,12,13) 중 하나 이상으로 전송될 것이다. A second point-to-point service is the mobile called party (MT) messages, which will be sent to one or more of the mobile stations (11, 12, 13) from the service center 14. 이동 착신(MT) 메시지들은 다른 이동 사용자들에 의해서나(메시지들을 통해) 또는 예컨대 음성, 텔렉스, 팩스, 이메일, 다중매체, 인터넷 등(미도시)과 같은 다양한 다른 서비스들에 의해서 동일한 서비스 센터(14)에 입력될 수 있다. Mobile terminated (MT) messages are the same service center by a variety of other services, such as or (via messages) or for example speech, telex, fax, email, multimedia, Internet, etc. (not shown) by other mobile users ( 14) may be input to. SMS 메시지가 전송될 때, 시스템은 상기 SMS 메시지에 수 개의 정보 엘리먼트를 첨부한다. When an SMS message is sent, the system attaches several information elements to the SMS message. 이러한 엘리먼트들은 전송 우선순위 데이터를 서비스 센터(14)에 제공하고, 유효 기간, 서비스-센터-시간 스탬프, 프로토콜 ID, 전송할 추가 메시지, 대기 중인 메시지, 및 서비스 센터 경보를 정의하거나 식별하는 데이터를 포함한다. These elements are sent first provides a ranking data to the service center (14), and the expiration date, and service - including a time stamp, protocol ID, add messages, pending messages, and service data to define or identify the centers alarm transfer - Center do. 이러한 엘리먼트들은 어떠한 방법으로, 그리고 언제 이동국(11, 12, 13)으로의 SMS 메시지 전송을 시도할 것인지를 결정하기 위해서 서비스 센터(14)에 의해 사용된다. These elements are used by the service center 14 to determine whether to attempt an SMS message delivery to in any way, and when the mobile station (11, 12, 13). 상기 유효 기간은 수신측으로의 전송이 수행되기 이전에 서비스 센터 메모리에 단문 메시지 서비스가 얼마나 오래 보존될 수 있는지를 나타낸다. The expiration date indicates that the transfer is to be carried out prior to the service center to the memory Short Message Service How long can be kept in the receiving side. 서비스 센터 시간 스탬프 엘리먼트는 서비스 센터가 단문 메시지 서비스를 언제 수신했는지와 관련한 정보를 보유한다. Service time stamp element holds information relating to the service center when you have received a short message service. 서비스-센터-시간 스탬프는 단문 메시지 서비스가 언제 서비스 센터로부터 제거될 수 있는지를 결정하기 위해 상기 유효 기간과 함께 사용된다. Service-Center - the time stamp is used along with the expiration date to determine whether there is a short message service can be removed anytime from the Service Center. 우선순위 엘리먼트는 서비스 센터가 이동국에 따라 해석하는 간단한 플래그인데, 비-우선순위 메시지의 전송은 이동국이 일시적으로 부재 중임이 식별될 경우에는 시도되지 않을 것이고, 우선순위 메시지의 전송은 이동국(11, 12, 13)이 도달할 수 없는 것으로 식별되지 않은 경우에는 시도될 것이다. Priority element service center is inde simple flag construed in accordance with the mobile station, the non-transmission of the priority message will not be attempted in the case is a mobile station temporarily the member being identified by a first transmission of the priority message is the mobile station (11, 12, 13) If you do not identify that can not be reached, it will be attempted. 이동국(11, 12, 13)으로 전송되는 SMS 메시지 내에는, 수 개의 헤더 정보 엘리먼트들이 존재하는데, 상기 헤더 정보 엘리먼트들은 전송자 ID 등과 같은 다양한 정보를 전달한다. In the SMS message transmitted to the mobile station (11, 12, 13) it is, for there are several header information elements, wherein the header information elements also conveys various information, such as sender ID. 어드레스 필드의 포맷은 표 1에 도시되어 있다. The format of the address field is shown in Table 1. 어드레스-타입 필드는 다수의 포맷으로 전송자 식별을 전송한다. Address-type field transmits a sender identification of a number of formats. 어드레스-타입 필드는 두 개의 엘리먼트, 즉, 번호-타입 및 번호화-계획-식별을 포함한다. Address - includes identification-type field of two elements, that is, the number-type and numbering-plan. 번호-타입 엘리먼트는 표 2에 설명된 바와 같이 코딩된 3비트를 포함한다. Number-type element comprises a 3-bit coding, as described in Table 2 below. 번호화-계획-식별 엘리먼트는 표 3에 설명된 바와 같이 코딩된 4비트를 포함한다. Numbering-plan-identification element comprises the coded bit 4 as described in Table 3 below. 번호-타입 = 101에 있어서, 번호화-계획-식별 비트가 예비되며, 0000이다. Number-in type = 101, numbering-plan-identification bits are reserved, and 0000. 엔터티 서비스 센터 중 임의의 센터를 어드레싱하기 위해서 MSC나 이동국 번호화-계획-식별 = 0001이 항상 사용될 것이라는 것을 주시하자. Let's consider that this will always be identified = 0001 - plan - MSC or mobile numbering to addressing any of the centers of the entity center. 3G 서비스가 실현되기 시작함에 따라, 네트워크는 핸드셋 위치에 기초하여 핸드셋으로 메시지들을 목표 지정함으로써 수익을 증가시키는 방식을 고찰한다. As the 3G services begin to be realized, the network examines the ways to increase revenue by targeting messages specified by the handset based on handset location. 네트워크들이 3G(또는 그 이후 세대) 규격들로 업그레이드됨으로써, 네트워크들은 상기 네트워크에서의 3각 측량을 사용하거나 핸드셋에서의 GPS 수신기를 사용하여 각각의 핸드셋의 위치에 대한 정보를 보유할 것이다. Networks are being upgraded to the 3G (or later generations) specifications, networks will hold information about the position of each handset, using triangulation in the network or using the GPS receiver in the handset. 이는 네트워크로 하여금 위치 감응 서비스들을 각각의 개별적인 핸드셋에 목표지정할 수 있게 할 것이다. This will allow the network to be able to specify the target position sensitive services to each individual handset. 당연히, 이는 광고자로부터 많은 양의 이점을 생성한다. Of course, it generates a large amount of benefits from the advertiser. 일예로, 사용자는 인접해 있는 백화점에서의 세일이나 인접한 식당에서의 점심 특별 메뉴를 알려주는 메시지를 수신할 수도 있다. As an example, a user to inform the lunch special menu at the restaurant adjacent to three days or in the adjacent department store may receive the message. 이러한 가능성은 무한하다. The possibilities are endless. 이러한 모든 것들의 한가지 단점은 이동 핸드셋들이 단지 자신이 수신한 메시지들을 저장할 한정된 크기의 메모리를 갖는다는 것이다. One disadvantage of all these things is that mobile handsets are just having a limited amount of memory to store the messages it receives. 따라서, 이러한 메시지들을 분류하거나 우선순위를 정하기 위한 시스템이 필요하다. Therefore, it is necessary first to classify these messages or the system for determining the rankings. 이를 위해서, 메시지들이 도착할 때 메시지들이 어떻게 처리되어야 하는지를 알려주는 우선순위 그룹으로 상기 메시지들을 카테고리화시키는 것이 필요하게 된다. To this end, if the messages are to be how to get messages are processed when informing the first priority group it is necessary to categorize the messages crystallized. 제 1 카테고리화 인자는 전송자의 식별일 수 있다. The first categorization factor may be an identification of the sender. 만약 사용자가 (예컨대, 핸드셋 전화 북이나 번호 디렉토리를 통해) 전송자를 알고 있다면, 디폴트 액션은 나중에 검색하기 위해 메시지를 저장하고 메시지 도착을 사용자에게 알려줄 것이다. If you know the sender (for example, through the handset phone book or directory number), the default action is to save the message for later retrieval and inform the message gets to you. 그런 후에, 사용자는 한가한 때에 메시지를 검색할 수 있다. Then, the user can retrieve messages when idle. 만약 메시지가 첨부된 선택적인 존속 상황(optional survival condition)을 갖는다면, 그 메시지는 상기 존속 상황이 더 이상 올바르지 않을 때까지 저장되어야 하며, 더 이상 올바르지 않은 경우 상기 메시지는 자동으로 삭제되어야 한다. If the message has an optional survival condition (optional survival condition) attachment, the message is to be automatically deleted when the message should be saved until the survival condition is no longer valid, that is no longer valid. 도 2는 우선순위화된 SMS 메시지들을 관리할 수 있는 이동국(11)의 수신기를 개략적인 형태로 나타낸다. Figure 2 shows a receiver of the mobile station 11 to manage prioritized SMS messages in schematic form. 이동국(11)은 수신기 및 디코더 회로(22)를 포함하는데, 상기 회로는 기지국(17, 18)으로부터 통신 신호들을 수신하여 디코딩한다(도 1 참조). The mobile station 11 comprises a receiver and decoder circuit 22, the circuit may receive and decode the communication signals from the base stations 17 and 18 (see Fig. 1). 수신기 및 디코더 회로(22)에 의해 수행되는 기능들은 그 자체가 널리 공지되어 있으며, 본 발명과는 직접적으로 관련되지 않는다. And the functions performed by the receiver and decoder circuit 22 are those that are well known themselves, it is not directly related to the present invention. 그러므로, 수신기 및 디코더 회로(22)의 기능들 및 동작들은 본 명세서에서 더 이상 상세하게 설명되지 않을 것이다. Therefore, the functions and operations of the receiver and decoder circuit 22 will not be described in any more detail herein. 수신기 및 디코더 회로(22)에 의해 수신되어 디코딩되는 SMS 메시지 데이터 는 버퍼(23)로 입력되고, 상기 버퍼(23)에서는 우선순위 데이터가 제어기(24)에 의해서 검사된다. SMS message data received and decoded by the receiver and decoder circuit 22 is input to the buffer 23, the priority data in the buffer 23 is checked by the controller 24. 제어기(24)는 GPS 회로(26)에 연결되고, 상기 GSP 회로(26)는 이동국(11)의 위치를 식별하는 위치 데이터를 제어기(24)에 제공한다. Controller 24 is coupled to a GPS circuit 26, the GSP circuit 26 provides the location data identifying the location of the mobile station 11 to the controller 24. GPS 회로(26)에 의해 수행되는 기능들은 그 자체가 널리 알려져 있으며 다양한 3G 표준들에 속하는 다양한 공공 이용가능 문헌들에 명시되어 있으므로 본 명세서에서는 더 이상 상세하게 설명될 필요가 없다. The functions performed by the GPS circuit 26 are in itself well-known and in the present specification it is specified in various public available documents pertaining to the various 3G standards no longer have to be described in detail. 제어기(24)는 또한 "알려진" 번호들을 식별하는 데이터가 저장되어 있는 디렉토리(25)로부터 전화 번호 데이터를 수신하도록 연결된다. Controller 24 is also coupled to receive telephone number data from a directory 25 that stores the data identifying "known" numbers. 통상적으로, 이는 사용자에 의해서 이동국에 입력되는 데이터일 것이다. Typically, this will be data entered into the mobile station by the user. 디렉토리는 제어기로 하여금 "알려진" 소스들로부터의 메시지들을 식별할 수 있게 하기 위한 룩업 테이블로서 기능을 한다. The directory will cause the controller to function as a lookup table to be able to identify messages from "known" source. 로컬 클록 회로(27)는 현재 시간을 식별하는 데이터를 제어기에 제공한다. Local clock circuit 27 provides the data identifying the current time to the controller. 시간 데이터는 클록 회로(27)에 의해서 내부적으로 생성될 수 있거나, 널리 공지된 바와 같이 수신기 및 디코더 회로에 의해 수신되는 신호에 포함된 시간 정보로부터 유도될 수 있다. Time data may be generated internally by the clock circuit 27, it can be derived from the time information included in the signal received by the receiver and decoder circuit as is well known. 저장부(28)는 디스플레이 패널(29) 상에서 디스플레이하기 위해 제어기(24)에 의해 선택되는 SMS 메시지들을 저장하기 위해서 또한 제공된다. A storage unit 28 is also provided for storing SMS messages selected by the controller 24 to display on the display panel 29. 상기 저장부는 두 부분, 즉, 현재 디스플레이를 위해 하나 이상의 메시지를 정의하는 데이터를 저장하기 위한 디스플레이 저장부(28a)와, 후속적으로 디스플레이하기 위해 사용자 선택시에 이용가능한 메시지들을 정의하는 데이터를 저장하기 위한 홀딩 저장부(28b)로 분할된다. Wherein the storage unit comprises two parts, that is, storing data defining messages available at the time the user selected to display the current in the display storage section (28a) for storing data defining one or more messages for display, subsequently It is divided into a holding store portion (28b) for. 실제로, 상기 저장부의 두 부분은 개별적인 유닛들로 제공되거나, 두 부분으로 나누어지는 단일 유닛으로서 제공될 수 있다. In practice, the two-part storage portion may be provided as individual units, may be provided as a single unit divided into two parts. 저장부(28)의 형태는 구현 선택 사항이다. In the form of a storage unit (28) is an implementation choice. 제어기(24)는 버퍼(23)로부터의 우선순위 정보, 디렉토리(25)로부터의 번호들, GPS 회로(26)로부터의 위치 데이터 및 클록 회로(27)로부터의 시간 데이터를 검사함으로써 수신된 SMS 메시지의 메시지 컨텐트를 어떻게 처리할 것인가를 결정한다. The controller 24 has received an SMS message by checking the time data from the position data and the clock circuit 27 from the numbers, GPS circuit 26 from the priority information, a directory (25) from the buffer 23 the content of the message is determined How to handle. 물론, 메시지들의 우선순위가 정해질 수 있는 다양한 방식이 존재한다. Of course, there are various ways in which the priority of the message may be determined. 한가지 방식은 SMS 메시지가 알려진 소스로부터 발신되는지 여부를 확인하기 위해 상기 SMS 메시지 내의 데이터를 고찰하는 것일 것이다. One way would be to consider the data in the SMS message to determine whether the SMS message originating from a source is known. 만약 상기 SMS 메시지가 알고있는 출처로부터 전송된 것이라면, 상기 메시지는 즉각적인 디스플레이나, 이동국 사용자에 의해서 필요시 후속적인 검색을 위해 저장부로 전달될 수 있다. If if sent from the source that the SMS message is known, the message by the immediate display or mobile station user may be delivered to the store for subsequent retrieval when needed. 첨부 도면 중 도 3은 이동국(11)의 송신기측을 개략적인 형태로 나타내고 있다. Figure 3 of the accompanying drawings shows the transmitter side of the mobile station 11 in schematic form. 송신기측의 유닛들 대부분은 위에서 설명된 수신기측의 유닛들과 동일하다. Most units on the transmitter side is the same as that of the receiver side of the unit described above. 단지 다른점들이 아래에서 설명될 것이다. Just to be different are described below. 이동국은 제어기(24)에 연결되어 있는 키패드(31)(통상적으로 모든 이동 전화기 상의 어디에나 있는 숫자식 키패드)를 포함한다. The mobile station comprises a keypad connected to the controller 24 (31) (conventional numerical keypad ubiquitous on all mobile phones in). 키패드 상에 있는 키(미도시)의 사용자 조작은 문자를 나타내는 데이터를 생성하여 제어기(24)에 입력되도록 한다. User operation of a key (not shown) on the keypad to generate data representing a character is to be input to the controller 24. 따라서, 생성된 데이터는 완전한 메시지가 생성될 때까지 저장부(28)의 홀딩 저장부(28b)내에 보유된다. Thus generated data is held in the holding storage portion (28b) of the storage unit 28 until a complete message to be generated. 일단 메시지가 전송될 준비가 되면(키패드를 통해 '전송' 명령을 사용자가 누름으로서 결정됨), 메시지 데이터는 제어기(24)에 의해서 저장부(28)로부터 판독되는데, 상기 제어기는 이동국을 식별하는 메시지 데이터와 필요할 경우 메시지의 시간 및 이동국의 전송시 위치를 식별하는 데이터를 추가한다. When the one end prepared to which the message is transmitted (a 'send' command via the keypad on the user and determined by pressing), the message data is read out from the storage unit 28 by the controller 24, the controller message that identifies the mobile station If necessary, the data is added to data identifying a location for transmission of time and the mobile station of the message. 시간 및 위치 데이터는 GPS 회로(26) 및 클록 회로(27)로부터 제어기(24)에 의해 획득된다. Time and position data is obtained from the GPS circuit 26 and the clock circuit 27 by the controller 24. 다음으로, 제어기(24)에 의해 편집된 데이터는 인코더 및 전송 회로(32)에 출력되고, 상기 인코더 및 전송 회로(32)는 SMS 서비스 센터(14)에 의한 추가적인 처리 및 전방 전송을 위해 통신 신호들을 인코딩하여 기지국에 전송한다. Next, the data edited by the controller 24 is output to the encoder and the transmission circuit 32, the encoder and the transmission circuit 32 is a communication signal for further processing and the forward transmission by the SMS service center (14) to encode and transmits to the base station. 이동국이 SMS 메시지를 수신하였을 때, SMS 메시지와 연관된 우선순위 데이터가 데이터를 어떻게 처리할 것인지를 결정하기 위해 처리된다. When the mobile station receives a SMS message, it is processed to determine if the priority data associated with the SMS message is how to handle the data. 다음의 예에서는, 가장 높은 우선순위가 수신 이동국의 사용자에게 알려진 소스(일예로, 다른 사용자들의 이동국들)로부터의 메시지에 할당되는 것이 가정된다. In the following example, it is assumed that the highest priority is assigned to messages from sources known to the user of the receiving mobile station (as an example, the mobile stations of other users). 만약 사용자가 소스를 알고 있다면, 인입하는 SMS 메시지는 즉각적이거나 후속적인 디스플레이를 위해 저장된다. If you know the source, SMS messages that are incoming or stored for subsequent display instantaneously. 만약 사용자가 SMS 메시지의 전송자를 알지 못한다면, 이동국(11)은 아래의 표 4에서 설명되는 바와 같이 미리 결정된 방식에 따라 메시지의 우선순위를 정할 수 있다. If the user can set the priority of messages based on the sender does not know of the SMS message, the mobile station 11 is a predetermined manner, as described in Table 4 below. 표 4에 설명된 방식에서, 우선순위 1은 가장 중요하고 가장 높은 우선순위의 메시지가 항상 저장 또는 디스플레이에 대한 우선권을 가진다는 것을 나타낸다. In the manner described in Table 4, priority 1 indicates that the message of the most important and the highest priority will always have a priority for storage or display. 더욱이, 높은-우선순위 메시지들은 만일 높은 우선순위 메시지가 존속하기 위해 저장 공간을 필요로 한다면 낮은 우선순위들을 자동-삭제할 수 있다. Moreover, the high-priority messages are if you need storage space for ten thousand and one high-priority messages are retained automatically lower priority - can be deleted. 표 4에 대한 고려로부터 당업자라면 알 수 있듯이, 메시지들의 우선순위 결정은 메시지(또는 메시지 헤더)에 오로지 3-비트만이 부가될 것을 필요로 하고 우선순위 1 내지 9를 사용하여 현재 메시지 처리를 지원할 수 있다. As can be appreciated by those skilled in the art from consideration of Table 4, the prioritizing of messages, the message (or message header) only 3-bit only requires to be added first and used to rank from 1 to 9 of supporting the current message processing for can. "알려진 송신자" 필드는 SMS 메시지가 이동국(11)에 의해 (설명된 바와 같이) 수신될 때 평가되며, 따라서 메시지는 시간 및 위치를 포함하는 존속 조건들만을 전달하면 된다. "Sender known" field is evaluated when the SMS message is received (as illustrated) by a mobile station (11), so the message is delivered when only the existence conditions including time and location. 적용될 타입을 결정하는 것은 네트워크에서 이뤄진다. Determining the type applied in the network achieved. 예를 들면, 다른 핸드셋으로부터의 메시지는 거짓으로 설정된 존속 및 디스플레이 조건들을 가지고 전송되어, 핸드셋이 송신자를 인식하는지 또는 못하는지에 따라 이후의 검색 및 디스플레이를 위해 저장부(29)내에 메시지를 저장한다. For example, a message from another handset is transmitted with the survival and display conditions set to false, and stores the message in the storage unit 29 to search and display after, depending on whether the handset to recognize the sender or mothaneunji. 광고의 경우, "디스플레이 전용" 조건은 위치 및/또는 존속 시간과 함께 설정될 수 있다. For line, "display only" condition could be set together with the position and / or duration. 이는 메시지가 사용자와 관련되는 한 단지 디스플레이만이 제공되며, 저장되지 않는다. Which is provided with a man you only display a message is relevant to the user, it is not stored. 이러한 형태의 메시지의 다른 예는 이들이 자신들의 목적지에 도달할 때까지 규칙적인 간격으로 가능한 한 자동 업데이팅하는 자신들의 현 위치로부터 원하는 목적지로 사용자 방향을 제공한다. Another example of this type of message is that they provide you directions to a desired destination from their current location to automatically updating one up as possible at regular intervals until they reach their destination. 이들은 차세대 통신 시스템들이 제공할 수 있는 가치-부가 서비스의 예이다. These values ​​can be provided by the next-generation communication system is an example of value-added services. 단문 메시지 서비스 우선순위화의 바람직한 구현은 이동국에서 이뤄지지만, 적정 정보 구조를 갖는 단문 메시지를 전달하기 위해서 이동 네트워크로부터의 지원을 필요로 한다. The preferred implementation of the short message service prioritization is only yirwojiji at the mobile station, and requires support from the mobile network to deliver short message having the appropriate information structure. 우선순위화 방식은 또한 이와 같은 우선순위 결정 설비를 포함하지 않는 이동국들에서 동작할 수 있다. Prioritization scheme may also be operated in the mobile stations that do not include such a prioritization facility. 이 경우, 16가지의 가능한 경우를 표시하는 상기 표 4는 단지 두 가지 경우 즉, 메시지 1 및 9만으로 축약되며, 여기서 송신자는 이동국에게 알려지거나 또는 알려지지 않았다. In this case, the above Table 4 that displays the 16 possible when the only other words two cases, and only a short message 1 and 9, where the sender is known or not known to the mobile station or. 이러한 간단한 예들로도 이득을 얻을 수 있으며 네트워크로부터 어떠한 추가의 지원도 필요로 하지 않는다. To obtain this simple example deulrodo gain and it does not by any additional support is required from the network. 네트워크 지원은 시간-기반 존속, 위치-기반 존속 및 디스플레이 전용 데이터 엘리먼트들이 단문 메시지 서비스 구조에 부가될 때 필요하다. Network support the time-based existence is needed to be added to, and display-only data elements are short message service structure-based survival, position. 포맷은 옥텟 N+1 까지는 동일하게 유지되고, 메시지가 디스플레이-전용, 존속 시간 및 존속-위치 정보를 포함하는지에 따라 확장형 모드 필드가 신호에 부가된다. Format is kept the same up to octet N + 1, the message is displayed - the extended mode field is added to the signal in accordance with that contains location information-only, survival time and survival. 확장형 모드 필드중 하나의 포맷의 예가 표 6에 개시되어 있다. An example of a format of the extended mode field is disclosed in Table 6 below. 6 6 존속 위치 데이터 제공 만일 0이라면, 어떠한 존속 위치 데이터가 포함되지 않음. If the existence position data provided ten thousand and one 0, not including any retained position data. 만일 1이라면, 존속 위치 데이터가 포함됨. If if one, included position data is retained. 5 5 존속 시간 데이터 제공 만일 0이라면, 어떠한 존속 데이터도 포함되지 않음. Duration data service if ten thousand and one 0, no existence of data which is not included. 만일 1이라면, 존속 시간 데이터가 제공됨. If if one, survival time data is supplied. 존속 시간 필드의 번역에 대한 비트 4 및 3 참조. Bit 4 and 3 for the duration of the translation field. 존속 시간 필드는 양의 정수 값을 가지며, 그 단위는 확장형 모드 필드의 비트 3&4에 의해 주어진다. Duration field has a positive integer value, the unit is given by bits 3 & 4 of the Extended mode field. 존속 위치 엘리먼트들의 하나의 포맷이 표 7에 개시된다. One format of the survival position elements is disclosed in Table 7. 상술된 우선순위화 방식은 메시지로 이동국내 메모리가 가득 차게되는 확률을 감소시킬 것이라는 것을 알 수 있을 것이다. The priority scheme described above is to be understood that it will reduce the probability that the message is moved to fill the domestic memory. 하지만, 메모리내 메시지가 메모리 용량에 도달하는 경우가 있을 수 있다. However, there are messages in the memory may be a case that reaches the memory capacity. 이러한 경우 중 하나는 사용자가 이동국으로부터 오래된 메시지를 삭제하지 않는 것이다. One such case is that the user does not delete old messages from the mobile station. 다른 경우는 짧은 시간 주기동안 이동국에서 다수의 메시지들이 동시에 도달하는 경우이다. Another case is when multiple messages arrive simultaneously at the mobile station for a short period of time. 메모리가 그 용량에 도달할 때, 제어기(24)는 인입되는 높은 우선순위의 입력 메시지에 대한 메모리내 공간을 확보할 목적으로 메모리로부터 선택된 메시지들을 삭제하기 위해 우선순위 데이터를 사용한다. When the memory reaches its capacity, the controller 24 uses the priority data to delete selected messages from the memory object to secure a space within the memory for incoming messages of higher priority incoming. 제어기는 또한 사용자에게 더이상 관심없는 메시지들을 버릴 수 있도록 사용자-정의 필터들(몇몇 이-메일 애플리케이션들과 매우 동일한 방식으로)을 적용할 수 있다. The controller also allows users not interested anymore discard message to the user - can be applied - to define a filter (in much the same way as some of the e-mail application). 당업자라면 상술된 방식이 셀룰러(또는 다른) 통신 시스템내 SMS 메시징에 적용될 수 있는 많은 방식들중 하나라는 것을 알 수 있을 것이다. Those skilled in the art will appreciate that the above-described manner is one of the cellular (or other) number of ways that can be applied to the SMS messaging in a communication system. 본 발명은 상술된 우선순위화 방식에 한정되지는 않는다. The present invention is not limited to the above-described priority scheme. 따라서, 본 발명이 바람직한 실시예에 의해 설명되었지만, 이러한 실시예는 예시만을 위한 것이며 당업자라면 첨부된 청구항에 개시된 본 발명의 사상에 기초하여 본 발명의 다양한 변경이 가능하다는 것을 알 수 있을 것이다. Therefore, the embodiment has been described by the present invention a preferred embodiment, such an embodiment will be appreciated that various modifications of the invention can be based on the spirit of the invention disclosed in the claims by those skilled in the art will attach for illustration only. 상기 이동국(11,12,13)에서 상기 메시지를 처리하는(24) 상기 단계는 상기 우선순위 특성에 기반하여 메시지에 대한 우선순위를 이동국(11,12,13)에서 독자적으로 할당하고, 상기 우선순위에 기반하여 상기 메시지를 저장하는(28) 것을 포함하는 것을 특징으로 하는 방법. The mobile station (11, 12, 13, 24) said step of processing the message is the first based on the rank attribute is assigned a priority for the messages on their own in the mobile station (11,12,13), said first, at characterized in that which comprises 28 which, based on the ranking storing the message. 제1항에 있어서, 상기 우선순위 특성을 할당하는 단계는 상기 메시지 소스를 식별하는 정보를 할당하는 단계를 포함하는 방법. The method of claim 1, further comprising: assigning the priority characteristic comprises assigning information identifying the message source. 제1항 또는 제2항에 있어서, 상기 우선순위 특성을 할당하는 단계는 상기 메시지를 시간 의존인 것으로 정의하는 시간 정보(27)를 할당하는 단계를 포함하는 방법. According to claim 1 or 2, wherein the step of assigning the priority characteristic comprises assigning time information (27) defining the message as being time dependent. 제1항 또는 제2항에 있어서, 상기 우선순위 특성을 할당하는 단계는 상기 메시지를 위치 의존인 것으로서 정의하는 위치 정보(26)를 할당하는 단계를 포함하는 방법. According to claim 1 or 2, wherein the step of assigning the priority characteristic comprises assigning position information (26) to define as being the location-dependent the message. 제1항 또는 제2항에 있어서, 상기 우선순위 특성을 할당하는 단계는 상기 메시지를 즉시 디스플레이를 위한 메시지로 정의하는 디스플레이 정보를 할당하는 단계를 포함하는 방법. According to claim 1 or 2, wherein the step of assigning the priority characteristic comprises assigning display information defining a message for immediate display the message. 제1항 또는 제2항에 있어서, 상기 우선순위 특성을 할당하는 단계는 상기 메시지를 이후 디스플레이를 위해 저장될 메시지로 정의하는 디스플레이 정보를 할당하는 단계를 포함하는 방법. According to claim 1 or 2, wherein the step of assigning the priority characteristic comprises assigning display information defining the message to be stored for subsequent display the message. 제1항 또는 제2항에 있어서, 상기 메시지는 상기 메시지 소스에서 생성되며 상기 이동국(11,12,13)으로의 전송을 위해 메시지 서비스 센터(14)로 전송되는 방법. According to claim 1 or 2, wherein the message is a method that is sent to the message service center (14) for transmission to said mobile station (11, 12, 13) is generated on the message source. 제7항에 있어서, 상기 우선순위 특성은 상기 메시지 서비스 센터(14)에서 각각의 메시지에 할당되는 방법. The method of claim 7, wherein the priority characteristic is assigned to each method of a message in the message service center (14). 제1항 또는 제2항에 있어서, 상기 우선순위 특성은 상기 메시지 소스에서 각각의 메시지에 할당되는 방법. The method of claim 1 or claim 2, wherein the priority characteristic is assigned to each method of a message in the message source. 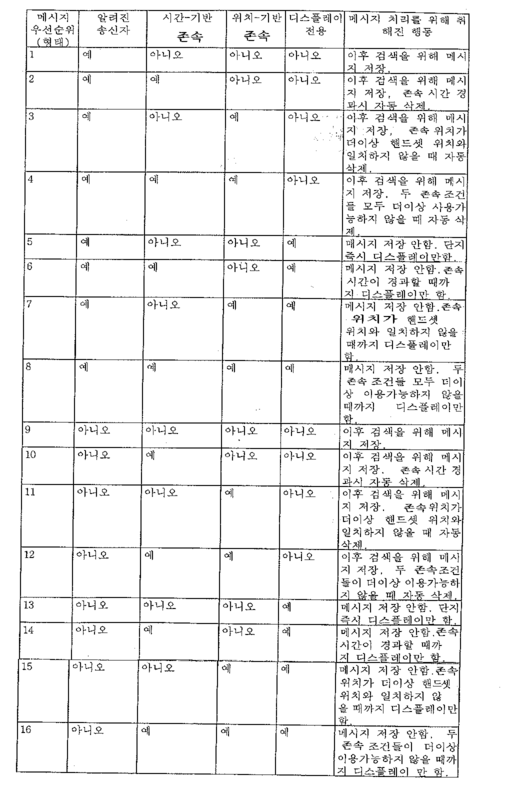 제1항에 있어서, 상기 방법은 상기 우선순위에 따라 상기 이동국(11,12,13)에서 디스플레이(29)를 위해 메시지를 저장하는(28) 단계를 더 포함하는 방법. The method of claim 1, wherein the method further comprising the 28 step of storing a message for display (29) at the mobile station (11,12,13) ​​depending on the priority. 제10항에 있어서, 상기 우선순위 특성을 할당하는 단계는 메시지 소스를 식별하는 정보를 할당하는 단계를 포함하며, 상기 메시지는 상기 메시지 소스가 알려진 소스인 경우에 저장되는 방법. The method of claim 10, further comprising: assigning the priority characteristic comprises the step of assigning information identifying the message source, the message is stored in a way that if the source is the message source is known. 제11항에 있어서, 상기 우선순위 특성을 할당하는 단계는 상기 메시지를 시간 의존인 것으로 정의하는 시간 정보(27)를 할당하는 단계를 포함하며, 상기 메시지는 만일 상기 시간 정보가 현재 시간이라면 저장되는 방법. The method of claim 11, further comprising: assigning the priority characteristic comprises the step of assigning time information (27) defining the message as a time-dependent, wherein the message that if that is the time information if the current time is stored Way. 제11항 또는 제12항에 있어서, 상기 우선순위 특성을 할당하는 단계는 상기 메시지를 위치 의존인 것으로 정의하는 위치 정보(26)를 할당하는 단계를 포함하며, 상기 메시지는 만일 상기 위치 정보가 현재 위치라면 저장되는 방법. 12. The method of claim 11 or 12, further comprising: assigning the priority characteristic comprises the step of assigning position information (26) defining the message as position dependent and the message is currently if said location information, how positions if that is stored. 제1항 또는 제2항에 있어서, 상기 방법은 만일 높은 우선순위를 갖는 새로운 메시지가 수신되었을 때 높은 우선순위 메시지의 저장을 가능하게 하기 위해 이전에 저장된 낮은 우선순위의 메시지를 삭제하는 단계를 더 포함하는 방법. The method of claim 1 or claim 2, wherein the method is the step of deleting a message of lower priority previously stored in order to enable storage of the higher priority message more time If the new message having a higher priority is received how to include. 상기 이동국(11,12,13)은 상기 우선순위에 따라 상기 메시지를 저장하는 수단(28)을 추가로 포함하는 것을 특징으로 하는 시스템. The mobile station (11,12,13) ​​is a system characterized in that it further comprises a means 28 for storing the message depending on the priority. 제15항에 있어서, 상기 우선순위 특성을 할당하는 수단(24)은 상기 메시지 소스를 식별하는 정보를 할당하는 수단을 포함하는 시스템. 16. The method of claim 15, wherein the means (24) for assigning the priority characteristic comprises means for assigning information identifying the message source. 제15항 또는 제16항에 있어서, 상기 우선순위 특성을 할당하는 수단(24)은 상기 메시지를 시간 의존인 것으로 정의하는 시간 정보를 할당하는 수단(27)을 포함하는 시스템. Claim 15 or system of claim 16 wherein means (24) for assigning the priority characteristic comprises means (27) for assigning time information defining the message as being time dependent. 제15항 또는 제16항에 있어서, 상기 우선순위 특성을 할당하는 수단(24)은 상기 메시지를 위치 의존인 것으로 정의하는 위치 정보(26)를 할당하는 수단을 포함하는 시스템. Claim 15 or system of claim 16 wherein means (24) for assigning the priority characteristic comprises means for assigning position information (26) defining the message as position dependent. 제15항 또는 제16항에 있어서, 상기 우선순위 특성을 할당하는 수단(24)은 상기 메시지를 즉시 디스플레이를 위한 메시지로 정의하는 디스플레이 정보를 할당하는 수단을 포함하는 시스템. Claim 15 or system of claim 16 wherein means (24) for assigning the priority characteristic comprises means for assigning display information defining a message for immediate display the message. 제15항 또는 제16항에 있어서, 상기 우선순위 특성을 할당하는 수단은 상기 메시지를 이후 디스플레이를 위해 저장될 메시지로 정의하는 디스플레이 정보를 할당하는 수단을 포함하는 시스템. Claim 15 according to any one of claims 16, wherein the means for assigning the priority characteristic comprises means for assigning display information defining the message to be stored for subsequent display the message. 제15항 또는 제16항에 있어서, 상기 메시지는 상기 메시지 소스에서 생성되며 상기 이동국(11,12,13)으로 전송을 위해 메시지 서비스 센터(14)로 전송되는 시스템. Claim 15 or claim 16, wherein the message is transmitted to the system is created from the message source, the mobile station (11,12,13), the message service center 14 for transmission. 제21항에 있어서, 상기 우선순위 특성은 상기 메시지 서비스 센터(14)에서 각각의 메시지에 할당되는 시스템. The method of claim 21, wherein the priority characteristic is assigned to the system, each message in said message service center (14). 제15항 또는 제16항에 있어서, 상기 우선순위 특성은 상기 이동국에서 각각의 메시지에 할당되는 시스템. Claim 15 or claim 16, wherein the priority characteristic is assigned to each system in which messages at the mobile station. 제15항에 있어서, 상기 저장 수단(28)은 상기 우선순위에 기반하여 이동국(11,12,13)에서 디스플레이(29)를 위한 메시지를 저장하도록 동작하는 시스템. 16. The method of claim 15, wherein the storage means 28 is a system that operates to store the message for display (29) at the mobile station (11, 12, 13) on the basis of the priority. 제24항에 있어서, 상기 우선순위 특성을 할당하는 수단(24)은 상기 메시지 소스를 식별하는 정보를 할당하는 수단을 포함하며, 상기 저장 수단(28)은 상기 소스가 알려진 소스인 경우에 상기 메시지를 저장하도록 동작하는 시스템. 25. The method of claim 24, wherein the means (24) for assigning the priority characteristic comprises means for assigning information identifying the message source, the storage means 28 is the message if the source is a known source system operative to store. 제25항에 있어서, 상기 우선순위 특성을 할당하는 수단(24)은 상기 메시지를 시간 의존인 것으로 정의하는 시간 정보를 할당하는 수단(27)을 포함하며, 상기 저장 수단(28)은 상기 시간 정보가 현재 시간인 경우에 상기 메시지를 저장하도록 동작하는 시스템. 26. The method of claim 25, wherein the means (24) for assigning the priority characteristic comprises means (27) for assigning time information defining the message as being time-dependent, the storage means 28 is information of the time a system operative to store the message if the current time. 제25항 또는 제26항에 있어서, 상기 우선순위 특성을 할당하는 수단(24)은 상기 메시지를 위치 의존인 것으로 정의하는 위치 정보를 할당하는 수단(26)을 포함하며, 상기 저장 수단(28)은 상기 위치 정보가 현재 위치인 경우에 상기 메시지를 저장하도록 동작하는 시스템. 26. The method of claim 25 or claim 26, wherein the means (24) for assigning the priority characteristic comprises means (26) for assigning position information defining the message as position dependent and the storage means 28 is a system that operates to store the message in the case where the location information is current location. 제15항 또는 제16항에 있어서, 상기 시스템은 높은 우선순위의 새로운 메시지가 수신될 때 높은 우선순위 메시지의 저장을 가능하게 하기 위해 이전에 저장된 낮은 우선순위의 메시지를 삭제하는 수단을 더 포함하는 시스템. 16. The method of claim 15 or 16, said system further comprising means for deleting a message of lower priority is stored in the previous order is received, a new message of higher priority, to enable storage of the higher priority message system. 상기 메시지의 우선순위 특성을 검사하며 상기 우선순위 특성에 기반하여 상기 메시지에 우선순위를 독자적으로 할당하고, 상기 우선순위에 기반하여 상기 저장부(28)에 상기 메시지 데이터를 저장하는 제어기(28)를 더 포함하는 것을 특징으로 하는 이동국. Examine the priority characteristic of the message, and the controller (28) for storing the message data in the priority characteristic based on the priority assigned to rank on its own in the message, and on the basis of the priority the storage section 28 the mobile station according to claim 1, further comprising. 상기 제어기(24)는 상기 디스플레이 스크린(29)상의 디스플레이를 위해 상기 메시지를 출력하거나 또는 이후 디스플레이를 위해 상기 메시지를 저장(28)함으로써 상기 디스플레이 정보에 응답하는 이동국. The controller 24 is a mobile station, responsive to the display information by storing (28) the message to the message output, or after the display for display on the display screen (29). 상기 제어기(24)는 만일 상기 메시지 소스가 알려진 소스라면, 상기 저장부(28) 내에 상기 메시지를 저장함으로써 상기 우선순위 특성에 응답하는 이동국. The controller (24) if the message source is known that if the source mobile station to the first response to the priority characteristic by storing the message in the storage unit 28. 상기 제어기(24)는 상기 클록 회로(27)에 연결되며 만일 상기 시간 정보가 현재 시간이라면 상기 메시지를 상기 저장부(28)내에 저장함으로써 상기 우선순위 특성에 응답하는 이동국. The controller 24 is a mobile station connected to the clock circuit 27 is responsive to the priority characteristic by storing ten thousand and one if the time information is current time of the message in the storage unit 28. 상기 제어기(24)는 상기 위치 회로(26)에 연결되며 만일 상기 위치 정보가 현재 위치라면 상기 메시지를 상기 저장부(28)에 저장함으로써 상기 우선순위 특성에 응답하는 이동국. The controller 24 is a mobile station connected to the position circuit 26 is responsive to the priority characteristic by storing the message. If the position information, the current position in the storage unit (28). 제29항 또는 제30항에 있어서, 상기 제어기(24)는 메시지 우선순위들을 정의하는 룩업 테이블(25)을 포함하며 만일 높은 우선순위의 새로운 메시지가 수신될 때 높은 우선순위 메시지를 저장부(28) 내에 저장하기 위해 이전에 저장된 낮은 우선순위의 메시지를 삭제하는 이동국. Claim 29 according to any one of claims 30, wherein the controller 24 includes a look-up table (25) defining message priorities and the portion (28 storing the high priority message is received, a new message of emergency high-priority before the mobile station to delete a message of lower priority it is stored in order to store in a).